Other photos: Profile Picture, Profile Picture, Profile Picture, Profile Picture, Profile Picture, Profile Picture, Profile Picture, Profile Picture, Profile Picture, Profile Picture, Profile Picture, Profile Picture, Profile Picture, Profile Picture, Profile Picture, Salon, Salon, Salon, Salon, Salon, Salon, Dinette, Dinette, Galley, Galley, Helm Station, Helm Station, Helm Station, Stair Access to Staterooms, Master Stateroom, Master Stateroom, Master Stateroom, Master Stateroom, Master Stateroom, Master Stateroom, Master Head, Master Head, Master Head, VIP Stateroom, VIP Stateroom, VIP Stateroom, VIP Stateroom, VIP Head, Port Guest Stateroom, Port Guest Stateroom, Port Guest Stateroom, Port Guest Stateroom, STB Guest Stateroom, STB Guest Stateroom, STB Guest Stateroom, STB Guest Stateroom, STB Guest Stateroom, STB Guest Head, STB Guest Head, STB Guest Head, STB Guest Head, Crew Head, Sunpad w/ three helm seats, Upper Helm, Bow Lounge, Bow Lounge, Bow Lounge, Bow Lounge, Cockpit, Cockpit, Teak in perfect condition., Dual Windlass, GARAGE. Sunseeker created the perfect yacht with this 84' Predator with some unique features that blow away similar sized express boats. There were 11 of these boats made by the prestigious manufacturer and Lilly is the only one available for sale at present time in the USA. A sport fly with sun lounge that does not interrupt the sleek design of the Predator. A bow lounge with seating area and reclinable sun pad. A Hydraulic swim platform and large garage for toys, tenders and skis. A Panoramic Sunroof that beautifully lights up the salon. Big CAT power, low hours (800), ABT Stabilizers and Hydraulic Thrusters. NEW Garmin Electronics, an incredible entertainment center with JL Audio all around, Airplay, Sound Zone distribution for salon, fly, bow and cockpit, Apple TV and all its features controlled via iPad. All Services up to date, new exterior upholstery, just buffed and waxed. 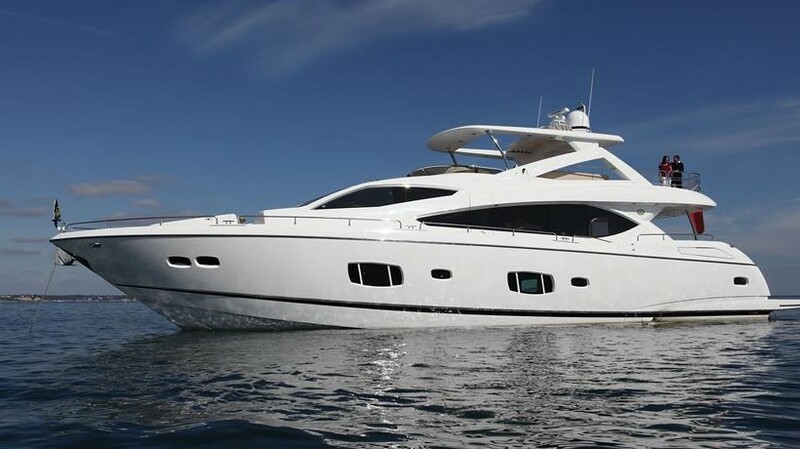 This yacht is meticulously maintained and turn key for the next owner. Schedule a private viewing today. Complimentary airport pick up/dropoff for out of state or international buyers.